Gary started jumping in 1987 during which time he’s amassed over 17,000 jumps. 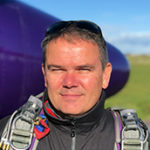 Besides being an incredibly popular instructor who oversees the day to day running of the operation, Gary is also a British Parachute Association Appointed Instructor Examiner looking after the training of our new instructors. Mike was our Chief Instructor for over 20 years before retiring in May 2018. Mike started jumping in 1978 and has since amassed over 15,500 jumps. We still break Mike out of retirement as needed. 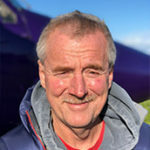 Mike is a British Parachute Association Instructor Examiner whose experience and expertise is invaluable in helping us train the next generation of instructors. Mike has a plethora of hobbies which include sailing, cycling and yoga so has plenty to occupy him during his well-deserved retirement when we’re not stealing him from his very understanding wife Jo. Airfield Owner, Instructor, Pilot, Display Team Leader. Martin is our much respected founder and airfield owner. Martin made his first jump in 1979 at the tender age of just 16 and has since gone on to make over 7,000 more. He worked as a design engineer and test jumper for a leading military parachute manufacturer during the mid 1980’s before moving onto other things. 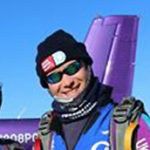 He has never lost his passion for the sport and is currently still a skydiver, pilot, instructor and display team leader who can regularly be found at the airfield helping out as part of the team. He had the vision and determination to purchase the airfield (or old farm as it was then) back in 1997 and turn it into the vibrant skydiving venue it is today. The rest as they say is history. Chris is instantly recognisable for his unique and eye catching Mohawk helmet! 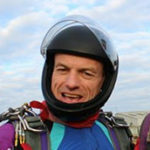 Chris started jumping in 2000 and has since amassed a staggering 11,500 jumps. Chris has a unique sense of humour that instantly puts even the most nervous of tandem students at ease. Lloyd made his first jump with us in 1999 and has since gone on to amassed over 12,000 more. He’s a much respected instructor who’s also a bit of an IT wizard – so if you’re struggling with a computer problem, just speak to Lloyd and he’ll be happy to offer some sage words of computing advice. 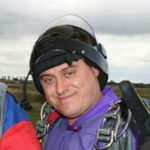 Renowned for his cheeky smile, Glen made his first jump in 1998 and has since amassed over 8,000 jumps. A highly gifted instructor whose northern humour is legendary. Outside skydiving, Glen is a Petrol-head and has been converting and repainting his beloved Mazda MX5 to track standard. As an on-going project if you have any useful motoring maintenance hints and tips, please let him know! Tim started jumping in 1997 and has since amassed over 6,000 jumps. 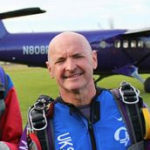 The British Parachute Association recognized Tim’s outstanding professionalism and capabilities by awarding him “Instructor of the year” in 2011. Chiseled on the mean streets of Glasgow, this Scotsman might not always be easy to understand but is extremely likable and a highly respected member of the team. 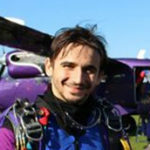 Originally from Romania, Dragos came to us in 2012 as an apprentice and has since amassed over 4,000 jumps. Dragos started off sweeping the hangar floor and helping pack the parachutes before graduating to become an incredibly talented camera flyer and in 2015 was awarded his Tandem Instructor rating. Dragos has also recently obtained his pilot’s license and is working towards his commercial license so who knows, you may also see this aviation fanatic flying our aircraft in a few years! 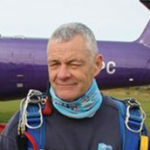 Kev started jumping part time in 2001 and has since amassed over 5,000 jumps. He’s an incredibly popular instructor who decided, because of his love of the sport, to go full time with us in 2015. Kev has recently qualified as a helicopter pilot. The multi talented and world record holding Craig is one of our part-time team members. 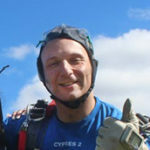 Craig started jumping with us in 1997 and has since amassed over 5,000 jumps. 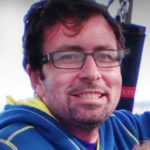 Craig was a member of the World Team that still holds the world record for the most number of skydivers in formation (400). 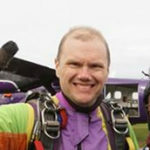 In what spare time he has now (he’s a Father to two young children) Craig is the Vice Chair of our governing body the British Parachute Association and Alternate delegate to the International Parachuting Committee. G grew up with aviation in his blood and has been flying since he was 4 years old, amassing to date over 10,000 flying hours. Initially learning to fly gliders, G progressed on to even more complex and diverse aircraft. 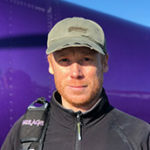 G is an extremely well-respected parachute pilot, flying instructor and both Civil Aviation Authority and British Parachute Association Pilot examiner with a wealth of flying experience that gives him his cool, calm and unflappable temperament. G is also a skydiver, fell runner and registered keeper of 3 energetic dogs. Aviation is in Si’s blood. Son to a RAF fast jet pilot and brother to a Captain with Cathay Pacific, Si is an exceptional pilot with over 4,500 flying hours and holds a British Parachute Association Pilots Examiner rating. He is also a keen skydiver and qualified parachute rigger. Si has also recently qualified as a Hot Air Balloon Pilot and will soon be dropping our experienced parachutists from our club hot air balloon. When not flying or jumping, Si is a speed demon, regularly taking his motorbike to track days. We are privileged to be one of the few parachute centres in the country to have a full time on-site Rigger responsible for maintaining our equipment to the highest of standards. 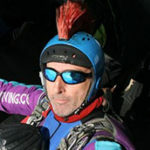 Kim has a tremendous wealth of experience having been involved in skydiving since 1986. 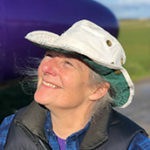 Kim was the first and only female Rigger Examiner in the British Parachute Association and has been responsible for helping train and develop the next generation of parachute Riggers to the highest industry standards ever since. Al started jumping in 2003 and has since amassed over 8,000 jumps. Al is a highly gifted Camera flyer who can often be seen wowing our spectators with his daring displays of high speed and acrobatic landings.